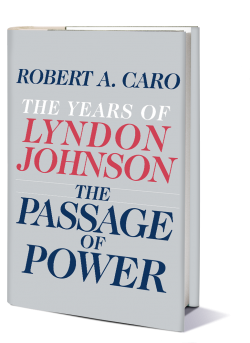 The Passage of Power follows Lyndon Johnson through both the most frustrating and the most triumphant periods of his career—1958 to1964. It is a time that would see him trade the extraordinary power he had created for himself as Senate Majority Leader for what became the wretched powerlessness of a Vice President in an administration that disdained and distrusted him. Yet it was, as well, the time in which the presidency, the goal he had always pursued, would be thrust upon him in the moment it took an assassin’s bullet to reach its mark. By 1958, as Johnson began to maneuver for the presidency, he was known as one of the most brilliant politicians of his time, the greatest Senate Leader in our history. But the 1960 nomination would go to the young senator from Massachusetts, John F. Kennedy. Caro gives us an unparalleled account of the machinations behind both the nomination and Kennedy’s decision to offer Johnson the vice presidency, revealing the extent of Robert Kennedy’s efforts to force Johnson off the ticket. With the consummate skill of a master storyteller, he exposes the savage animosity between Johnson and Kennedy’s younger brother, portraying one of America’s great political feuds. Yet Robert Kennedy’s overt contempt for Johnson was only part of the burden of humiliation and isolation he bore as Vice President. With a singular understanding of Johnson’s heart and mind, Caro describes what it was like for this mighty politician to find himself altogether powerless in a world in which power is the crucial commodity. For the first time, in Caro’s breathtakingly vivid narrative, we see the Kennedy assassination through Lyndon Johnson’s eyes. We watch Johnson step into the presidency, inheriting a staff fiercely loyal to his slain predecessor; a Congress determined to retain its power over the executive branch; and a nation in shock and mourning. We see how within weeks—grasping the reins of the presidency with supreme mastery—he propels through Congress essential legislation that at the time of Kennedy’s death seemed hopelessly logjammed and seizes on a dormant Kennedy program to create the revolutionary War on Poverty. Caro makes clear how the political genius with which Johnson had ruled the Senate now enabled him to make the presidency wholly his own. This was without doubt Johnson’s finest hour, before his aspirations and accomplishments were overshadowed and eroded by the trap of Vietnam. © Copyright 2012 Robert A. Caro. All rights reserved.